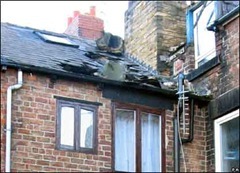 19 yr old David Bates had to be taken to hospital after a chimney collapsed into his bedroom and broke his pelvis. 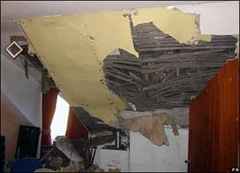 The wrecked ceiling of next door neighbour Kleber Afonso’s house in Wombwell. 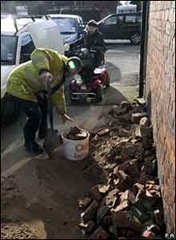 Rubble from a collapsed chimney stack is cleared in Selby, North Yorkshire. Insurance experts said claims for structural damage and broken belongings were set to run into tens of millions of pounds. This entry was posted on Thursday, February 28th, 2008 at 12:47 am	and is filed under News. You can follow any responses to this entry through the RSS 2.0 feed. You can skip to the end and leave a response. Pinging is currently not allowed.